^ 1.0 1.1 1.2 1.3 Planetary Satellite Mean Orbital Parameters. Jet Propulsion Laboratory, California Institute of Technology. ^ 3.0 3.1 Bills, Bruce G. Free and forced obliquities of the Galilean satellites of Jupiter. Icarus. 2005, 175: 233–247. doi:10.1016/j.icarus.2004.10.028. ^ 4.0 4.1 Yeomans, Donald K. Planetary Satellite Physical Parameters. JPL Solar System Dynamics. 2006-07-13 [2007-11-05]. ^ Orton, G.S. ; Spencer, G.R. ; 等. Galileo Photopolarimeter-radiometer observations of Jupiter and the Galilean Satellites. Science. 1996, 274 (5286): 389–391. Bibcode:1996Sci...274..389O. doi:10.1126/science.274.5286.389. ^ 9.0 9.1 Jupiter's Moons. The Planetary Society. [2007-12-07]. （原始内容存档于2007-12-31）. ^ 10.0 10.1 10.2 10.3 Ganymede. nineplanets.org. October 31, 1997 [2008-02-27]. ^ Solar System's largest moon likely has a hidden ocean. Jet Propulsion Laboratory. NASA. 2000-12-16 [2008-01-11]. ^ Sidereus Nuncius. Eastern Michigan University. [2008-01-11]. （原始内容存档于2001-02-23）. ^ 15.0 15.1 15.2 15.3 15.4 Satellites of Jupiter. The Galileo Project. [2007-11-24]. ^ 16.0 16.1 Pioneer 11. Solar System Exploration. [2008-01-06]. （原始内容存档于2011-09-02）. ^ 17.0 17.1 The Discovery of the Galilean Satellites. Views of the Solar System. Space Research Institute, Russian Academy of Sciences. [2007-11-24]. （原始内容存档于2007-11-18）. ^ Zezong, Xi, "The Discovery of Jupiter's Satellite Made by Gan De 2000 years Before Galileo," Chinese Physics 2 (3) (1982): 664–67. ^ 21.0 21.1 High Tide on Europa. SPACE.com. [2007-12-07]. （原始内容存档于2002-10-17）. ^ Ganymede: the Giant Moon. Wayne RESA. [2007-12-31]. （原始内容存档于2007-12-02）. ^ 36.0 36.1 36.2 Freeman, J. Non-Newtonian stagnant lid convection and the thermal evolution of Ganymede and Callisto (PDF). Planetary and Space Science. 2006, 54: 2–14. doi:10.1016/j.pss.2005.10.003. （原始内容 (pdf)存档于2007-08-24）. ^ Ganymede. Lunar and Planetary Institute. 1997. ^ Hubble Finds Thin Oxygen Atmosphere on Ganymede. Jet Propulsion Laboratory. NASA. October 1996 [2008-01-15]. （原始内容存档于2009-05-04）. ^ Johnson, R.E. Polar “Caps” on Ganymede and Io Revisited. Icarus. 1997, 128 (2): 469–471. doi:10.1006/icar.1997.5746. 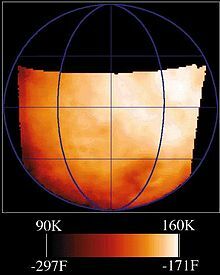 ^ Brown, Michael E. A Search for a Sodium Atmosphere around Ganymede. Icarus. 1997, 126 (1): 236–238. doi:10.1006/icar.1996.5675. ^ Hauck, Steven A. Internal structure and mechanism of core convection on Ganymede (pdf). Lunar and Planetary Science. 2002, XXXIII: 1380. ^ 65.0 65.1 65.2 65.3 65.4 McKinnon, William B. On convection in ice I shells of outer Solar System bodies, with detailed application to Callisto. Icarus. 2006, 183: 435–450. doi:10.1016/j.icarus.2006.03.004. ^ Exploration of Ganymede. Terraformers Society of Canada. [2008-01-06]. （原始内容存档于2007-03-19）. ^ Voyager 1 and 2. ThinkQuest. [2008-01-06]. （原始内容存档于2007-12-26）. ^ The Voyager Planetary Mission. Views of the Solar System. [2008-01-06]. ^ New Discoveries From Galileo. Jet Propulsion Laboratory. [2008-01-06]. ^ Pluto-Bound New Horizons Spacecraft Gets A Boost From Jupiter. Space Daily. [2008-01-06]. ^ Rincon, Paul. Jupiter in space agencies' sights. BBC News. 2009-02-20 [2009-02-20]. ^ Cosmic Vision 2015–2025 Proposals. ESA. 2007-07-21 [2009-02-20]. ^ Jupiter Icy Moons Orbiter (JIMO). The Internet Encyclopedia of Science. [2008-01-06]. ^ Jupiter Icy Moons Orbiter Victim of Budget Cut. Planet Surveyor. [2008-01-06]. （原始内容存档于2016-03-05）.